The Husky #3 x 6-inch Phillips Screwdriver features a designed pentagonal type handle to provide greater handle torque and more comfort. Unique dual material handle remove grip slippage during high torque applications. The tip size marking is injected on the end of handle for easy identification and longevity. The alloy-steel blade is heat treated for strength, precision formed tip for accurate fit and limits cam-out. The Phillips<sup></sup> screwdrivers in this 6 piece set feature a precision-machined tip for an exact fit. High visibility, oil and solvent resistant acetate handle provides a secure grip. Made in Canada and backed by Gray Tools worry-free lifetime warranty. The Husky 1/4-inch x 4-inch Slotted Screwdriver features an alloy-steel blade that is heat treated for strength and nickel plated for corrosion resistance. Features a serrated tip that provides engagement with fasteners and limits cam-out and stripped screw heads. Tough, durable acetate handle withstands exposure to solvents and chemicals commonly found on worksites and in automotive shops. The Husky #1 x 3-inch Phillips Screwdriver features an alloy-steel blade that is heat treated for strength and nickel plated for corrosion resistance. The precision-formed tip provides engagement with fasteners and limits cam-out and stripped screw-heads. Tough, durable acetate handle withstands exposure to solvents and chemicals commonly found on worksites and in automotive shops. 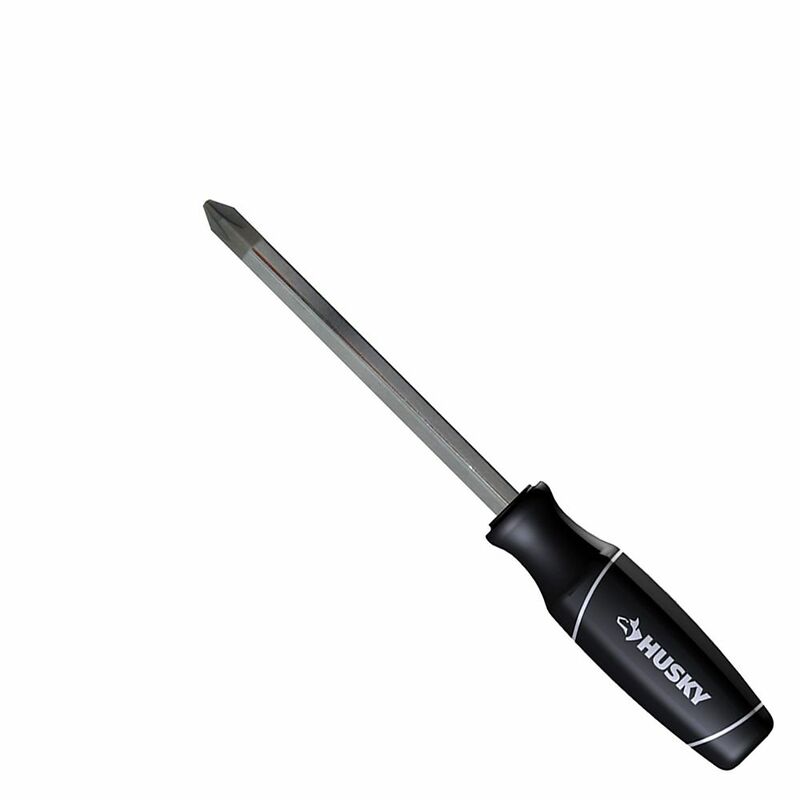 The Husky #2 x 1 1/2-inch Phillips Screwdriver features an alloy-steel blade that is heat treated for strength and nickel plated for corrosion resistance. The precision-formed tip provides engagement with fasteners and limits cam-out and stripped screw-heads. Tough, durable acetate handle withstands exposure to solvents and chemicals commonly found on worksites and in automotive shops. 3 x 6-inch Phillips Screwdriver The Husky #3 x 6-inch Phillips Screwdriver features a designed pentagonal type handle to provide greater handle torque and more comfort. Unique dual material handle remove grip slippage during high torque applications. The tip size marking is injected on the end of handle for easy identification and longevity. The alloy-steel blade is heat treated for strength, precision formed tip for accurate fit and limits cam-out.